LaaLaa is gone, at least in the flesh which was getting pretty worn out and we were immensely relieved to free her of her pain and weakness. She was with us almost l4 years. She was the most remarkable of little pups. She never took her eyes off me, cocked her head at every sound I made. She had too long a nose and her bones were not big enough. So her potential for breeding and the show ring was minimal. And she was very small, too small for showing. But she was so intelligent and so connected when she was only a few weeks old, I had to keep her, show ring or not. Well she surprised everyone. She had the fastest recall her trainer ever saw. When we finally did take her in the ring, her movement was so extraordinary that she took four majors in one weekend and was a champion. Handlers and judges called each other to talk about her movement. 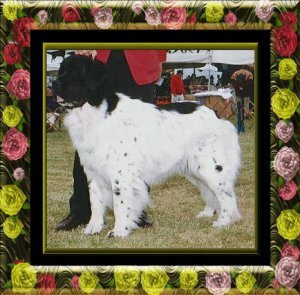 Then she produced Bumper, Gus, Bouba who also became champions who then had their own champion offspring. 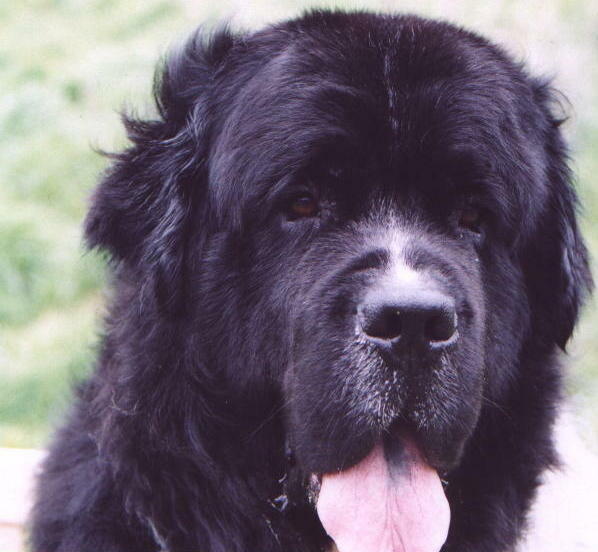 Bouba became the number l newfie in France. 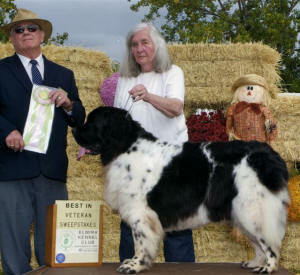 And LaaLaa, at age 11, got an award for best veteran in one of the shows. LaaLaa has also passed on wonderful genes. While she could still climb the stairs, she occupied my pillows and wrapped herself around my head to sleep. Tail over my face, head on top of my head. She ran the kennel with an iron hand just as her mother Katie did. She would jump a guy twice her size to stop a fence fight and chase him back to his kennel. However she would lead her little pack over to a kennel to start a fence fight when she thought it was appropriate. I remember her trotting along on the trails, suddenly looking over her shoulder to give the attack signal, and off three or four of them would race to have a “conversation”. Once, out on the trail, their walker paused to take something from her pocket. A cookie fell out. Four dogs leaped backwards away from the cookie. They knew who was the boss. LaaLaa walked in and took the cookie to which she and she alone was entitled. Her daughter Elsa has taken on LaaLaa’s role. 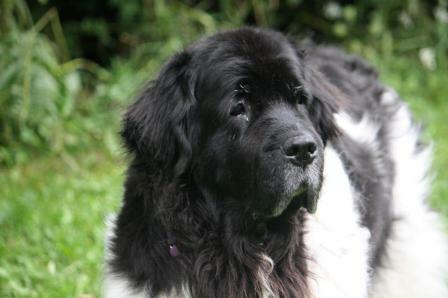 Dear Rudy, Carole Bernard's best girl, passed last week, gently in the night with her head on Carole's chest. Her heart at 12 and a half had just worn out. She was a remarkable girl, her temperment, her structure, her movement, her power, her beauty were accliamed all over Europe. Just a year ago she was the Wolrd Champion Veteran Newfoundland, taking the kudos in Paris at the World Show. 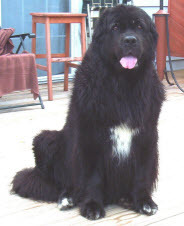 She was #2 Newfoundland in France during the time her nephew Bouba was #1. 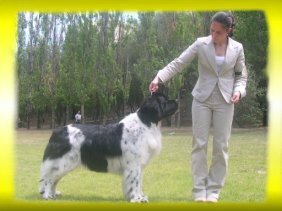 Rudy was a daughter of our Ch. Catherine the Great VN and our Packard. She went to France to start a kennel. And she did. Theo and Celeste and Jules are her children here in the US, all champions. She has many more in Europe. 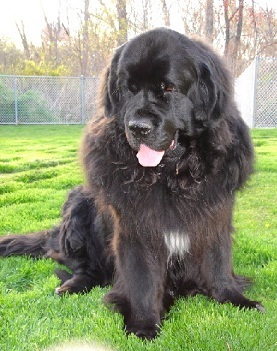 Her kennel is Tadoussac Newfoundlands in Brittany. Carole Bernard did a marvelous job training and showing her. Rudy did ocean rescue work. and very grateful to Carole for her love and dedication. What Daddy and I will remember most about you was your attraction to humans and their attraction to you. I’m not sure if it was because you were always happy or because of your sensitivity or perhaps a little of both. It seemed that you started your life with us showing us how attracted to people you were. Driving home from Blue Heaven we stopped at a rest stop to take you for a walk. You very politely walked over to a group of people sitting on the grass and just lay down beside them for a while. You would rather be with people than eat. I saw this the day you dropped a biscuit from your mouth while a small child petted you. I remember many of the funny little things you did. As a puppy when you went out to go potty two seconds out the door and you would be chasing bugs, I’d say Minnow you have to go potty and you’d pop your head up with an “oops, oh! I forgot.“ Once when I went to the door to let you out it was pouring down rain. I said “Minnow it’s raining cats and dogs! ” your reaction – let me at them! I liked to say you were the Gracie Allen of the dog world. I remember the puppy zooms you used to do around the family room couch – just for no reason. I remember how you would wake me up with a cold nose poke on Saturday mornings. I would have to get out of bed so that you could get in and cuddle with Daddy. When Daddy would stall about taking you for your morning walk you would come and find me and watch as I nagged him to get going. It always amazed me that your senses were so keen. You could see deer in the woods when no one else could. You knew when a car was turning into the driveway. When we played hide and seek you could not only track my path but my most recent path. You knew when Toots was stressed or about to become ill. You would fetch me with a very still and serious gaze. We spent one Thanksgiving Day at Aunt Bevy’s house. Dinner was served buffet style. When she called “dinner’s ready” everyone lined up, then some one began to giggle - you were in line! At VOSM the photographer for the local magazine chose you as one of her subjects. She started to photograph you by lying on the floor in front of you. Then she stood up to adjust her camera so you sat up and perfectly presented your profile. Hunting Easter eggs and having treats from your Christmas were two of your favorite things. We rode together on the golf cart, your idea of carting. You were also a sled dog as we rode together down the hill on the toboggan. Even as an old dog you loved to play. You would hunt over and over again for your mechanical “piggy”, pounce on the mechanical “tigger” as it bounced or turn on a dime to chase a spot of light from an infrared pointer. You loved to visit Grandma Toots at the nursing home and had a group of friends you had to see when ever we went. We took you out to get your “people fix” whenever we could. You could spot a dog lover in need from several yards away. So often it was some one who was remembering the loss of a pet. They would talk with us as you sat by them and they stroked your fur. I remember your tenth birthday when we took you to the local garden center. People would stop to pet you and when some one would say “Happy Birthday” you would acknowledge with your doggie smile and an extra tail wag. At one point there was actually a line of people waiting to wish you well. When you became ill and had to have a liquid diet, you would sit in front of me and lift your chin so I could tie an apron around your neck. Many, many people will remember you, those who knew you well and the many strangers you met. Daddy liked to say that just your presence had a calming effect. Even now when I look at a picture of you your happy face brightens my day. This great big, beautiful boy was a Packard/Katie son born in January 2000. 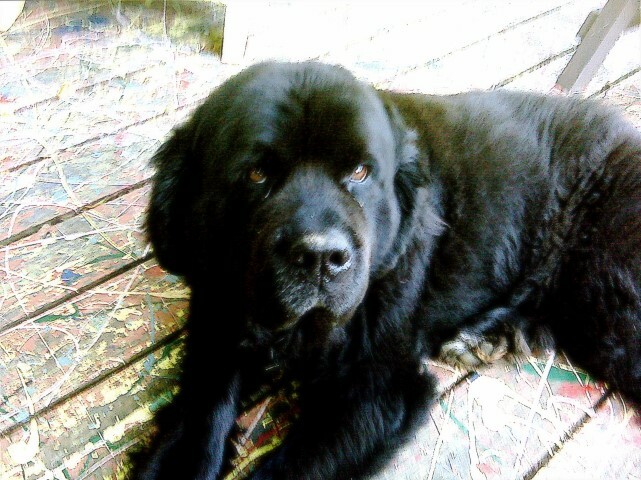 Tasha, our daughter's rescue passed away on a Sunday at 14 1/2. The next Saturday, heartbroken Daisy, who was 13 1/2, had been living with them for four years and had also been ailing, gave in as well. Both girls had wonderful, long lives and brought joy to many. They are and will always be sorely missed. Ch. 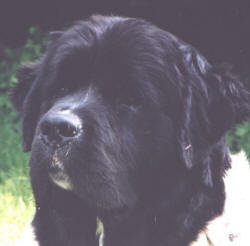 Blue Heaven's Captain America: "Joey"
Ch. Blue Heaven's Captain America has left us. 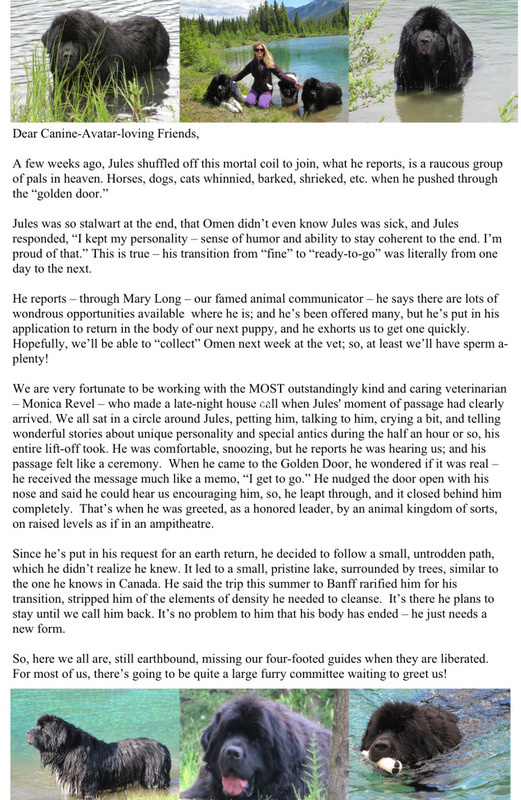 Joey was a single pup, son of our famous Ishtar. I carried him around in a bag hanging from my neck so he wouldn't be lonely. He was joyous, noisy and funny and always happy to see people and other dogs. He said when he got to heaven he became very very big, as big as the Sphinx and could see over the mountains to the ocean. He also reports he finally receives esteem. He has never had esteem before, he says, but he has lots of it now and it feels very good. He was our goof ball. He and Annie, his half sister, challenged each other over one particular red clutch ball. When Annie wanted it, he always just dropped it for her. Whenever we went into his run his tail was always wagging as fast as it could. It was an invitation to come in and visit. When he finally took his championship, we asked him what he did differently. He said, "I made believe I was swimming. I put my head up high above the water, stretched my front legs out as far as I could and kicked my back legs as hard as I could." He was right. Joey gave us beautiful puppies and a wonderful time. He enjoyed every minute of his life. And so did we. 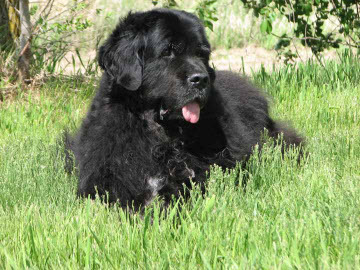 Blue Heaven's Yukon Queen: "Annie"
Ch.Blue Heaven's Yukon Queen has left us at ten and a half wonderful years. Annie was just like her mother Ishtar. I can remember saying no to her only once. She was as good as gold, steady, loyal and solid.. Even without coat she took an Award of Merit at Westminster. Her movement was magnificent and her bone and head extraordinary. 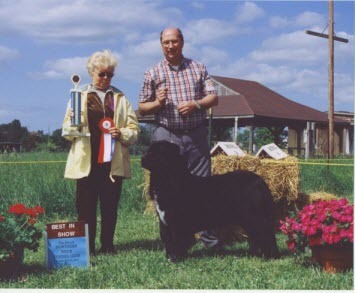 She produced some wonderful offspring, among which are International Champion Blue Heaven's Standard Bearer and Laurel Rabschutz's famous dancing dogs Ben and Rollo. She had a generous spirit. She didn't share all of her knuckle bones but when we asked her to nurse Laalaa's puppies, she was happy to help. Our best memory of Annie was the way she climbed the stairs every night to our bedroom. Even though at the end it was a struggle, she always gave a strong celebratory hop on the last stair. And we always stood still and watched and laughed at her happiness. 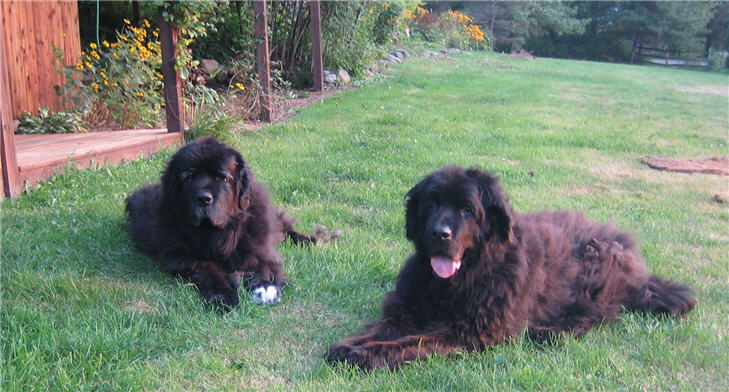 Children of Ch Blue Heaven's Mornings at Seven (Pippa) and Ch TopMast Checkers When he wasn't watching t.v., Alex spent his life as a therapy dog with the clients of his owner who is a psychotherapist. He knew all the jingles, especially if the ads had animals in them and would run to watch when he heard them. Inka spent her life doing whatever she wanted to. She loved digging for mice with her sister. She loved swimming and fetching, and refused to come out of the water, waiting even past dark for someone to throw the darned stick! The first word she could spell was c-a-r. They will be horribly missed and always adored. Inka told us through the animal communicator, "Don't think you're done with me yet!" They were 10 1/2 years old. 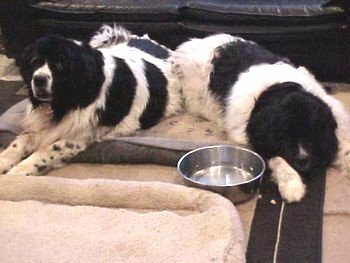 Here is a recent photo when Inka (left) went to Long Island to visit her brother for Christmas 2005.